A hatch, a hatch !! So the dark patch / hole between the two bees with their bums in the air is a hatch, where a queen has cut her way out and emerged from her cell. This means she is out and roaming the hive, still a virgin until she is mature enough to go on mating flights (about 4 days from hatch – Saturday), and we have the weather and the drones (cross fingers). I wasn’t so lucky with the two mating hives, they both failed. On opening them the queens were not being cared for and only about 20% of the bees that I had put in were left in the hive. Lessons – follow instructions about stocking mini-nucs, or at least move them to another apiary so the flying bees don’t just go to the hive they started in. I also suspect that putting the queen cells in the metal cages might have dissuaded the bees from looking after them due to being cold metal – next time have comb to press the cell into. Still, I have a hatch from my own first grafting, one way or the other its a win. Even if the queen does not make it to mated, I’ve kept the colony from turning to laying workers (or just being bored). I’m going to leave them to a week on Saturday (12th April) so she has had time to become mature and hopefully had a weather window to get out and mated; maybe by then I will get to see eggs, fingers crossed. I have so much to learn. 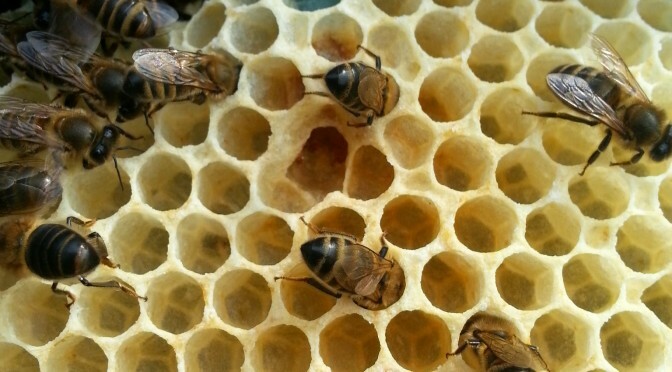 I shared your excitement when I read and fully appreciated your post that a queen had hatched and now I can’t wait to find out if there are eggs …. Cross fingers for her because the bees are so calm in there, just like the hive her egg came from. They are not her children so I guess its just her pheromones are that calming. I’ll have to keep checking in. I hate unhappy endings whether they are on film or in a hive.